← Like, totally grody fer sure! One of my children left some of her uneaten lunch in her backpack. Then she carelessly left the aromatic backpack on the floor when we all left the house for a few hours. That poor backpack never even had a chance. I’m sure they tried (at least for a few minutes) but our two starving hounds couldn’t stave off the alluring temptation of a leftover peanut butter sandwich and some orange peels. We came home to binders, pencils, papers and a shredded pack strewn across the front room. Grinning nervously at us sat two very sheepish dogs. 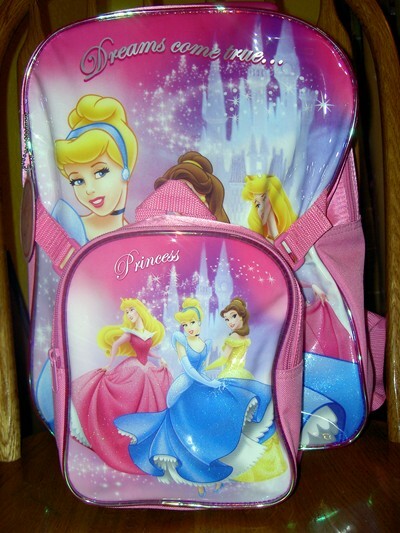 Fortunately for my child, this backpack was on its third year. It made it much easier for me to fork out the bucks for a new one. Unfortunately for my child, backpacks at the end of September are pretty much limited to the ones marked down seventy five percent. Cheap, but oh so ugly! The first store we stopped at gave her a choice between the “Duff Stuff” and the “Fantastic Four”. The next stop gave us a few more choices. We finally settled on a very sturdy pack with all sorts of nifty pockets and features. It also came with a very fancy price tag, but I figured it could last through college and beyond. The next morning she eagerly headed off to school with her new pack. It was a huge hit! All of her friends (and even some strangers) adored it. Maybe it is true that junior high is a lot different now than when I was a kid. I’m guessing I’ll have to go out and find her a tiara to wear to school next. Where did you say you found that? I want one too! I already have the tiara. Great backpack! I miss those mom/daughter shopping trips from the teenage days. Or do I? They certainly are quite a bit different now that she is 28 – and its her money! Times do change. I have to give her credit for tapping into her princess-self! After all, she is your daughter. Don’t forget the faux glass slippers to match the tiarra. I WANT ONE! Would go perfectly with my grey curly hair and over the hill “princess” look.